Teleopti WFM wherever you are! The Teleopti WFM workforce management solution is now available for your smartphone and tablet through two cutting edge web based tools for management and employees who need access to the right information regardless of when and where. Today’s managers need real time intelligence on the go, tools that help them keep an eye on their operations from anywhere at any time! 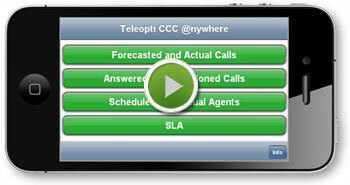 Teleopti WFM Anywhere is a mobile dashboard that lets you keep track of your contact centre’s availability and SLA, forecasted and actual volumes as well as planned and actual resources. Its clean interface, intuitive navigation and natural touch gestures allow you to get things done quickly, easily and with style. View schedules, input work time preferences and availability and communicate in real time, from the office or from home, from a PC, Mac, smartphone or tablet. Teleopti WFM MyTime Web allows agents to stay in touch with their schedules and supervisors and get notified of last minute changes wherever they are. Increase efficiency, improve communication and adherence and empower your agents all in one solution. Would you like to know more about the advantages with Teleopti WFM Anywhere and Teleopti WFM MyTime Web? View the film clips above and contact info@teleopti.com today!